We give a chance to athletes to offer us somebody for an interview. Johanna Talihärm take this opportunity, so we have a very special interview again. We have interview with a little talented girl from a very little nation of biathlon. She is the girl who surprised everybody in Kontiolahti in the Youth and Junior World Championships in 2012. Yes, she is Chardine Sloof from Netherlands. BFH: Dear Chardine, thank you to accept our interview request. You are a special person in the world of biathlon. You race in the colours of Netherlands, which isn't famous from this sport. The climate and the natural conditions aren't seems suitable. Tell to us please why did you choose biathlon and when did you start your career? 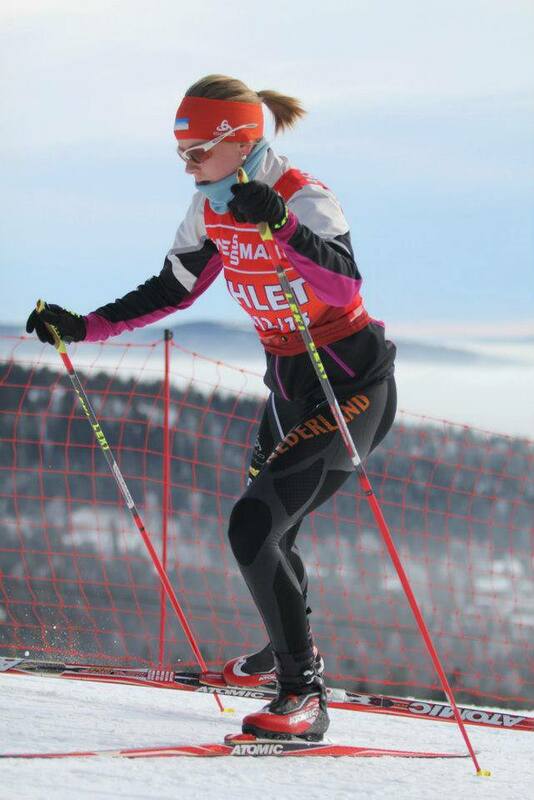 Chardine: I started with Biathlon when i was 10 years old, when i was 15 years old i did my first international race in Geilo (NOR) at that time still called europa-cup in the junior competition.I started with biathlon because my older brother did it (when we already lived in Sweden). One day i was there at the training to watch and I got the chance to shoot one time and that sold me. BFH: In 1999 you moved to Sweden with your family. Everybody say biathlon is one big family. This statement is absolutely true for you, because you live in a real biathlon family. Your brothers are biathletes too, and your father is your coach. What it feels like such a fantastic family to live? Chardine: Its great I am very happy to get this support from my family. It helps me a lot. a lot of people say they wouldn't be able to do it the way we do, but i like it. Of course sometimes it can be hard but mostly it makes it easier, like talking about things. Its also very good to have them around me during traveling in the winter because it doesn't make me longing to home so much except for seeing my mom of course. 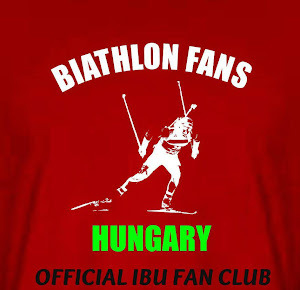 BFH: Biathlon is one of the most beautiful sport in the world, but unfortunately in Hungary isn't popular. Has Netherlands the same problem? Chardine: At the last olympic games biathlon was the second best watched sport on the TV in the Netherlands. People like to watch and the most have seen it, but ice speed skating will always be number one because thats the winter sport from the Netherlands. I think the biggest problem in the Netherlands is that we never have a real winter, when there is 5 cm of snow it is one big chaos with traffic. And Shooting in the Netherlands is not very possible in the way we do it in biathlon. BFH: The little nations always get help from the bigger nations. From which nations do you get the most help and with who do you have the best relationship? Chardine: Thats the beauty of biathlon cause when you need help everybody is willing to help. Right now i am in Norway and get a lot of help from them. BFH: Unfortunately you have problems during the last season, we saw that you can't start in the sprint in the WCH, and you must to gave up the individual. But it is positive, that you achieved your personally best World Cup results and won the Swedish Championships. How do you remember to your last season? Chardine: The start of the season was great, after Christmas in Ostrov (RUS) I even made my best spot so far in the IBU-cup, so i was in good shape but after that i got sick and the most important races all fell under it. I tried in the last few world cups to come back and I felt I made progress every race but I didn't come back the way i had hoped. BFH: Your nation is in the 33th place now. The best 28th can start in Sochi next year. You are a hard situation to qualify yourself to Sochi like our biathlete Emoke, because you are the only one woman from Netherlands in the World Cup series. Do you see chances to complete it? Our fan group's motto is 'Impossible is nothing! ', so we hope you'll say yes for this question! Chardine: I would love to say nothing is impossible. but for me it is impossible to make Sochi. As the information i got, it is the nation points you get in the last world championships (Ruhpolding 2012 and Nove Mesto 2013), not the world cup nation points. Im not really sure what place I am on but i thought around 38th. That means I am far away from 28th and I am sure that it is impossible. BFH: What are your other goals for the next season? Chardine: My biggest goal is to make the Olympic qualification from the Dutch olympic committee, Just to try to show that i am capable of doing that. And of course make better places in the world cup then i did last year I know I should be able to do that. BFH: In 2012 you surprised the world. You won 2 gold medal in Kontiolahti in the Youth and Junior World Championships. Your individual win was fantastic, but your pursuit win from the 8th place was amazing. In 2015 the World Championships will be there, you already have great memories from this track. What do you think, will you repeat your wins? And, how do you remember back to the Junior WCH competitions? I think they were your most beautiful days in your life. Chardine: yes they really were, i liked the track very much. When we had our races there it wasn't so cold like the world cup the week before so it was perfect. I will of course try to be there and hoping for the best. It is still far away so its hard to say anything about places. But its always a dream to be able to stand the highest again in the big competitions. BFH: Are you started your preparation for the next season or you have some day from your rest time? Will you have special trainings? Chardine:I have start training in May, unfortunately I had an injury with my knee so I was out for almost two weeks. Right now everyday is getting better and I will train real hard for the coming season. BFH: How did you spend your free time? What hobbies do you have? Could you live for them? Chardine: I went a week to London with my family, that was very nice. I bake a lot, i love to bake infact, thats my hobby. BFH: We would like to thank you the interview and we wish you the best to your next season and a good preparation. Finally, would you like to send a special message to the Hungarian fans? Chardine: Dear Hungarian fans keep cheering for the dutch woman team, right now we are not so many but maybe one day we will be more Thank you!